There are numerous components used in the electronics industry to build finished goods, ranging from small personal electronic devices to appliances, airplanes, automobiles, and manufacturing equipment. Using the right mix of parts is important to ensure they operate according to the design specifications for the device. Controlling when, where and how power is regulated through the device involves relying on such internal electronic components as Potter and Brumfield relays. Electronic relays are magnetically driven and typically have no moving parts. Functions are regulated and controlled using electronic magnets and magnetic fields. Whenever a magnetic field is applied, the device performs one set of functions and another prescribed set of functions when there is not a magnetic field present. 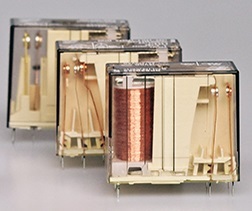 Relays are sometimes referred to as a switch because of how they operate. Relays may also be used to generate magnetic fields used to operate and control Hall Effect sensors. What Industries Use Potter and Brumfield Relays? There are numerous industries which rely on Potter and Brumfield relays in the design and construction of their electronic components and devices. The speed of switching cycle counts in electronic relays must be precise for accurate and reliable device operation. Potter and Brumfield is a leading global supplier of relays due to the precision and accuracy of their relay products. Intelligent Buildings: From new state-of-the-art smart homes, to large office complexes, relays are used to control many devices within buildings, such as heating and cooling systems, elevators, lighting, security systems, and solar power. Automation and Control: Relays are used in basic control circuits as well as complex interfaces in automation and control equipment. Automotive: Climate controls, lighting, entertainment systems, power steering, and other automobile functions are regulated and controlled using relay switching. Rail: Relays play a vital role in railway control systems and signaling systems, from onboard systems to external railway monitoring and track control. Hybrid and Electric Mobility: Today’s electric and hybrid vehicles require precision Potter and Brumfield relays with the ability to handle higher power levels and DC voltages. Appliances: Appliances incorporate relays into their product designs for a wide range of functions, such as lighting, fan control, compressor operations, and more. Even larger household appliances like air conditioners and water heaters use relays. Aerospace and Marine: Electronic relays, wire and cable supports, connectors, and other electronic components and parts are widely used in airplanes and boats of all sizes, for a variety of operations and functions. Military and Government Defense: From fighter jets to aircraft carriers, precision controlled relays and other Potter and Brumfield electronic parts are commonly used components. Industrial and Commercial Transportation: Full sized semi-trucks, RVs, buses, construction equipment, and agricultural machinery all require the right relay switches to manage specific functions. To source Potter and Brumfield relays or other electronic parts and components, contact us here at Procure International by calling 321-773-9991. We are an electronic component procurement company with free component sourcing services and access to large inventories of electronic parts and components from numerous manufacturers.